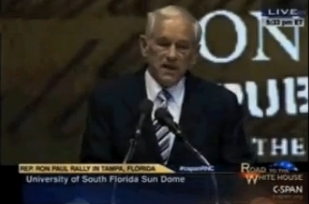 Rep. Ron Paul MD spoke at the Ron Paul Rally at the University of South Florida Sun Dome, preceding the Republican National Convention in Tampa on August 26, 2012. "Talking about foreign policy like this, and emphasizing Blow Back, somebody rather nastily said the other day on the internet, and they said 'Oh yeah, if those Paul people had been in charge, Osama Bin Laden would still be alive.' But you know what I think the answer is? So would the 3000 people from 9/11 be alive!" At that, the crowd cheered. The Convention is where delegates are meant to cast votes for the nominee, yet the Tampa Bay Times Forum was already plastered with embedded Romney banners, and additional 'Mitt' signs for people to hold were also smuggled in to make it appear that many are behind him. All Ron Paul material was promptly confiscated. Six states filed to put Ron Paul into nomination while the rules still said it only took five states. Realizing this, the RNC met early Tuesday morning to change the rules in order to make the minimum needed as eight states, which Ron also would have had if the RNC had not decided to take the Ron Paul delegates away from LA and ME. One bus of delegates on the way to the RNC was essentially kidnapped for two hours, and arrived too late to vote on the matter said the RNC. Rather than taking proper vote counts or listening to objections, several votes were clearly not unanimous, but this didn't stop the RNC "leaders" from ignoring the dissent. Video surfaced just after this video published, but a link is in the video showing that the teleprompter already had pre-approved results before the public vote was taken. Ron Paul's name and delegate totals were not allowed to be mentioned officially on the stage, even when he won the specific state. The Republican Party has lost all hope, and the disrespect Paul supporters received will eventually be replied with "I told you so." Joe on Sat, 09/01/2012 - 6:59am. Both the Republican and Democratic wings of the war-and-Wall-St. party are tightly controlled from the top. They deplore any attempts to exercise power from the grassroots. And this is the fate that is in store for those who think there is still a chance of 'reforming' them. rm on Sat, 09/01/2012 - 10:29pm.